If you have noticed lately, I've been open to re-visiting restaurants. It was not like that before you know. Think of it, why would I blog about something over and over again? However, it makes sense. On a re-visit, there are different dishes to try as well as changes in the menu, chef or ownership. Furthermore, some restaurants have multiple locations. Not all are created equal. 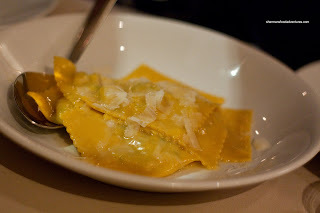 And probably the most important rationale is that I just happen to like the place and really want to eat there again! 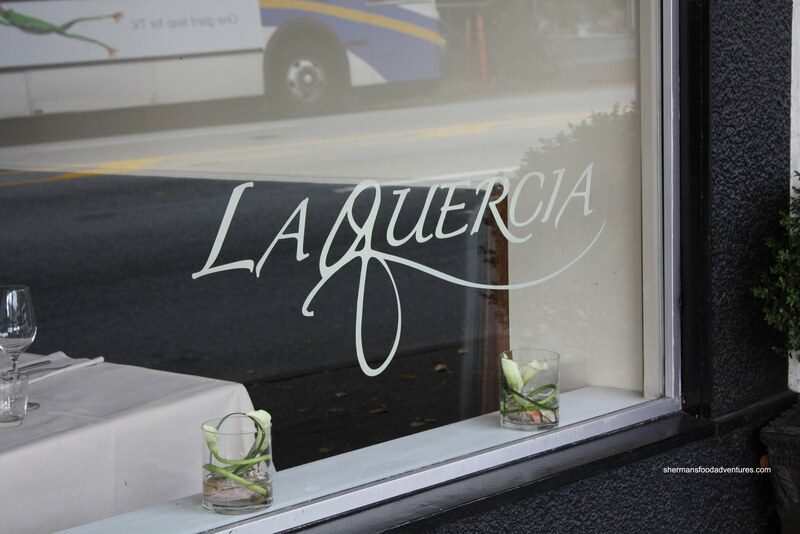 That is the case with La Quercia. When Costanza indicated that would be one of the places he'd like go for his birthday, I offered up very little resistance. Not knowing that we could not do the larger "alla famigla" meal for an early seating, we were a bit disappointed when attempting to order it. Mind you, the smaller "alla famigla" meal is no slouch either. It's more than enough food to go around. For those unfamiliar with their "alla famigla" dinner, it is a meal consisting of several courses (typically 5 for the smaller and 9 for the larger) served on one platter to share. 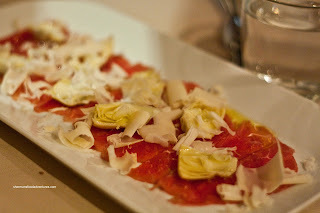 For tonight's meal, we started with a Carne Salada with artichoke hearts and shaved piave ch eese. Brined for 3 weeks in spices, garlic and juniper berries, the veal was buttery with a smidgen of meat texture. The slight gaminess of the piave combined with the saltiness of the artichokes complimented the mild veal quite well. Next up was an Endive Salad with a bagna cauda dressing consisting of anchovies, garlic and olive oil. The salad was fresh and crisp. It stood up well to the salty dressing. 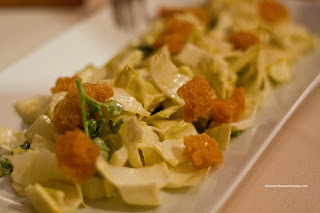 We particularly liked the duck fat croutons, they were rich and crunchy. 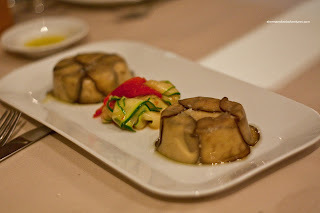 Last time, we had a Parmesan cheese souffle, this time around, it was an Eggplant Sformato which is a twice-baked eggplant souffle. Eggplant is a fussy thing to prepare. Overcook it and it'll be mush. Undercook it and you'll be eating Styrofoam. I'm happy to report that the thin eggplant slices were perfect. They encased a fluffy concoction which was creamy and smooth. As rich as it was, it was light at the same time with a nice salt kick at the end, finished off with a touch of Castella di Ama olive oil. Probably the most memorable dish of the night had to be the Ravioli of Porchetta, potato, ricotta and Parmesan with sage butter. Inside the perfectly al dente fresh pasta was a pronounced taste of roast pork. The potato and ricotta helped bring the whole thing together texturally. I didn't get a whole lot of sage; but that worked for me since I don't prefer too much sage anyways. For our last course before dessert, we were presented with a Flat-Iron Steak topped by arugula, Parmesan, pine nuts and balsamic vinaigrette. Cooked medium-rare, the large portion of steak was mostly tender except for certain sections. Those certain sections were actually quite chewy due to the nature of the meat. No harm, no foul, that is not the restaurants' fault. After all, they executed the steak perfectly. The balsamic vinaigrette was an excellent compliment to the meaty steak. In a sense, it had certain qualities that made it similar to beef tataki. That familiar taste made it exceptionally delicious. 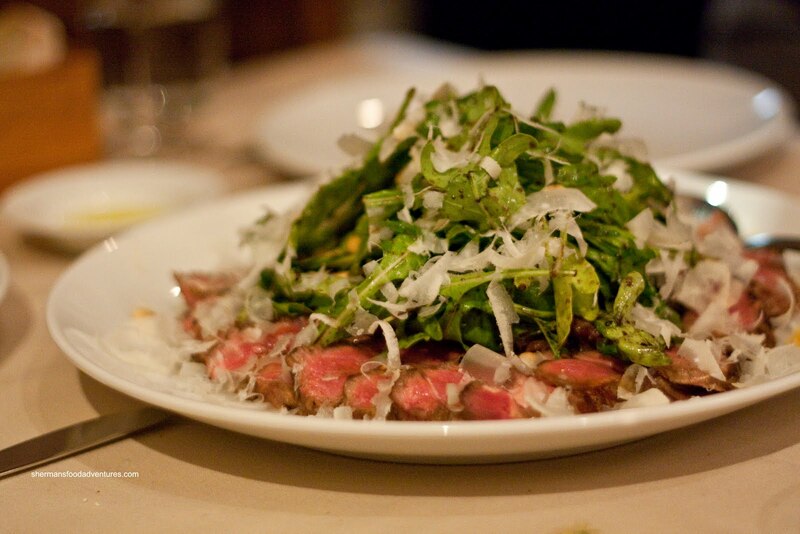 The combination of arugula, pine nuts and Parmesan made for a nice salad to go with the steak. Finally. We made it to dessert. 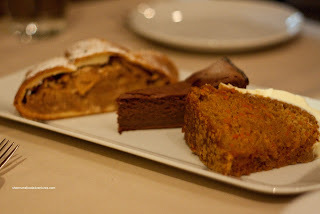 With that, we were presented with a plate of 3 items consisting of a Carrot Cake, Flourless Chocolate Cake with chestnuts and Apple Raisin Strudel. Of the 3, my favourite had to be the carrot cake. It was not heavy at all nor very sweet. The cream cheese frosting was also not too heavy. It was sweet though and was the necessary compliment to the mild tasting cake. The chocolate cake was not bad. It was somewhat dense due to the lack of flour and the addition of chestnuts. I'm not a huge fan of chestnuts so my opinion is probably biased. I did like that the cake was not sweet and had all the nice qualities of dark chocolate. As for the strudel, I wasn't a huge fan. It was curiously dry despite the "wet" filling. Flavour-wise, it was somewhat bland and uninspired. 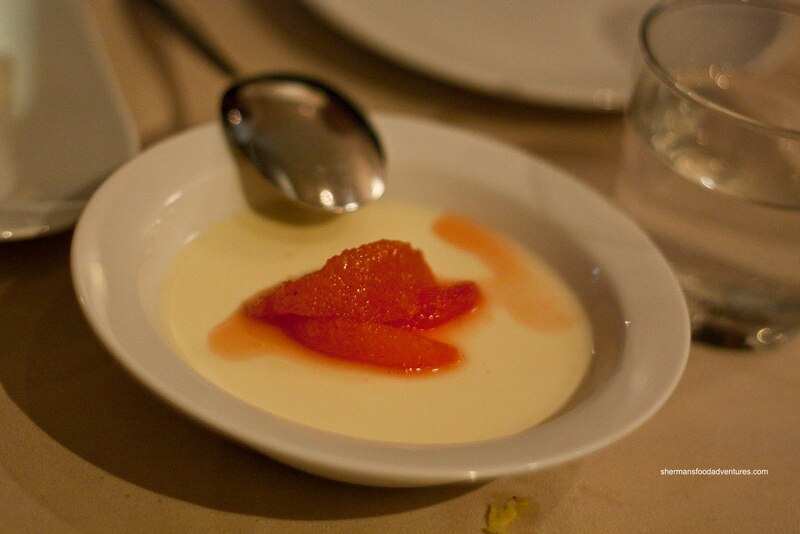 On the flip side, the Sabayon with grapefruit was a veritable flavour explosion. An attention-getting tartness balanced by an equal amount of sweetness, we couldn't get enough of this. Combined with a desirable texture, this was the highlight of the desserts. And that was a fitting end to another fabulous meal. Once again, La Quercia offered up a dinner that was both delicious and interesting at a very reasonable price. Service is top-notch and the room is cozy. We really can't wait to return to try the 9-course alla famigla dinner. Just have to remember to book a time after the main dinner rush. 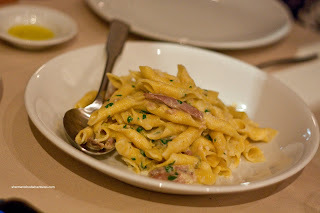 Would it be needless to say that La Quercia is way better than some-other-place-we-went-that-should-remain-unnamed-in-the-meantime? I would find it odd that some dishes aren't available for the earlier seatings. Could it be they still need some prep or love before they can be served (Specially with secondi/meat dishes)? Also, with so much food, chances are people might want to stay for a bit longer... But, then again, I am not the one running the business so I won't say anymore! Now, how many people minimum for the "Alla Famiglia"? This one is relatively dry while the udon is wet. 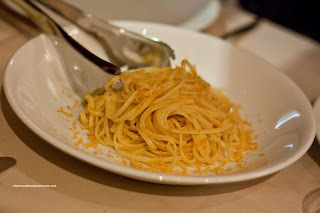 (The sentence above is in reference to a pasta dish. Man, please... Please tell me that was un-intentional! SFF, I agree, such as the case here, different stuff! Kim, the reason is that the larger alla famigla takes longer to eat, thus the later seating. You need 2 minimum.